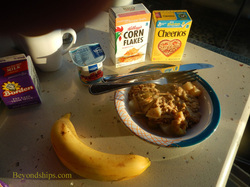 Traditionally, and still on many cruise ships today, your choices for breakfast were either the main dining room or the ship's buffet restaurant. On Allure of the Seas, you have those options but also several other alternatives as well. 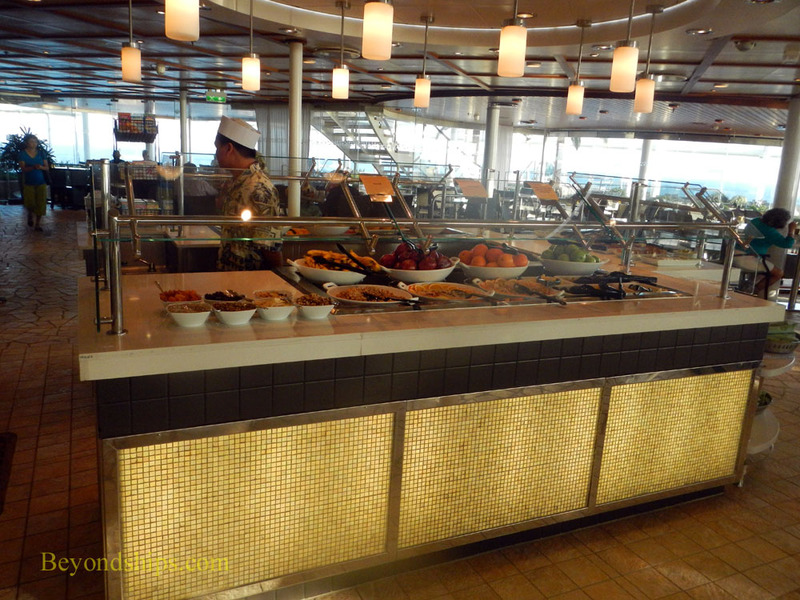 In fact, on a one week cruise, you will be hard pressed to find the time to sample all of the different breakfast venues. Perhaps the most unusual breakfast venue on Allure is the Johnny Rockets on Allure's Broadwalk. Johnny Rockets is, of course, a well-known chain of hamburger restaurants modeled on the American diners of the 1950s. 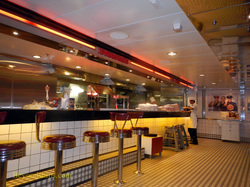 There are seagoing versions of Johnny Rockets on several of the larger Royal Caribbean ships. However, Johnny Rockets is only open for breakfast on Allure and sister ship Oasis of the Seas. Furthermore, while there is a cover charge if you visit Johnny Rockets for lunch or dinner, breakfast is complimentary. The breakfast menu at Johnny Rockets is, not surprisingly, like the breakfast menu that you would find at an American diner. It includes such things as French Toast, pancakes, scrambled eggs and omlettes. There are also side dishes like bacon, sausage, and hash brown potatoes. On our first visit to Johnny Rockets we had the French Toast along with scrambled eggs. The French Toast was soft and warm. The eggs arrived at the table hot. On the table were individual size containers of artificial maple syrup. Overall, the dishes were tasty. It was not a gourmet experience but then you don't expect that from a diner. Moreover, unlike many diners we have experienced the food here was not greasy. Returning for a second visit, we ordered an omelet. The omelet listed on the menu is quite basic but we found that the staff were willing to produce a more elaborate omelet upon request provided that the kitchen had the requested ingredients. This resulted in a tasty cheese and peppers omelet. Again, not greasy. During our visit early in the cruise, there were only a few passengers having breakfast at Johnny Rockets. However, during our second visit the restaurant was quite busy with almost all of the tables both inside and on the boardwalk full. The staff dressed in their 1950s uniforms were constantly speeding by with dishes. There was no time for the staff dance performances that are a hallmark of the lunch/dinner experience at Johnny Rockets. Breakfast at the Solarium Bistro is as far as you can get from Johnny Rockets both literally and figuratively. While Johnny Rockets is on one of the lower decks near the ship's stern, the Solarium Bistro is high up on the ship's superstructure overlooking the bow. Whereas Johnny Rockets is all about comfort food, the Solarium Bistro is the spot to come for a healthy breakfast. The Solarium Bistro is a buffet restaurant. On the center island, there is a selection of fresh fruits and cereals including varieties of muesli that change each day. You can also get yogurt, oatmeal and granola parfaits. And for those who want some variety, there are also waffles and muffins of various types. On a sunny morning at sea, the Solarium Bistro is an oasis of calm. 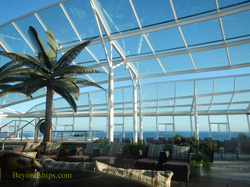 Inside the Solarium are plants and pools. Outside of the glass windows, you have panoramic views of the sea. Further aft on Deck 15, the Wipeout Cafe specializes in eggs cooked to order. The guest tells the staff what ingredients he or she wants in the omelet and are given a number. When the omelet is ready, the staff brings it to the guest. The Wipeout Cafe does not have much atmosphere. There is an adjoining seating area that is sheltered from the elements but which does not have a view. The best seating is the tables along the starboard side of the ship where you have a view of the sea. Another venue where you can design your own breakfast is the Park Cafe in Allure's Central Park neighborhood. Here, you can tell a staff member which ingredients you want on your bagel. 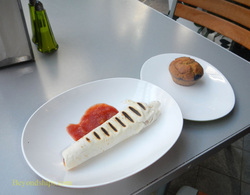 Alternatively, this venue offers items such as breakfast enchiladas, wraps and sandwich croissants. There are also boxes of cereal, oatmeal, and fresh fruit. Various types of muffins, banana bread and pastries are also available. The Park Cafe has both indoor seating and open air tables in Central Park. The outside tables are much superior as the park area is not only pretty but surprisingly peaceful as the ship slowly wakes for another day. If you are just looking for a quick bite, Boardwalk Donuts offers a selection of donuts along with a variety of coffees. This is essentially a self serve counter with a number of tables located by the entrance to the Boardwalk neighborhood. Along the same lines, you can stop by the Cafe Promenade on the Royal Promenade for pastires, muffins and coffee. Of course, if you do not want to emerge from your stateroom for breakfast, Allure offers room service. We tried this alternative on two occasions, each time leaving the door hanger menu outside the stateroom the night before. At the time we had designated on the hanger, we received a call from room service saying that the meal was on its way. A few minutes later there was a knock on the door and a pleasantly cheery waiter brought in the tray. The food was warm and included all of the items that had been ordered.